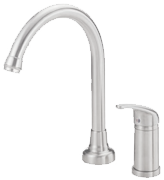 No doubt you’re on the hunt for a new kitchen faucet (since you’ve taken the time to look at my website), and in this section I have a range of different pull out faucets for you. Just like pull-down faucets all of these have an additional hose cleverly hidden inside the spout. However, a pull out type is slightly more flexible. This is because they make it possible for you to pull the hose away from the sink for filling pots and pans on your countertop (among other things). If you would like to find out more about this before you take a look at the reviews below, feel free to take a look at my informational page Pull-Out vs. Pull-Down. Enjoy!